I've been using M.Y.O.B. for years as my accounting program, primarily to keep track of my expenses and income as a writer. Now that my husband is self-employed, I thought I'd try a program that so many people have recommended to me: QuickBooks. I especially liked the idea of being able to do my banking online - this would save a lot of hassle writing checks and mailing them. Installation of QuickBooks Pro 99 was fairly painless and soon the "Welcome" screen appeared. Do you send out monthly statements? This was actually pretty easy - there were a few things I was not sure about, but the HELP provided in the program explained things a bit better and answered any questions I had. I especially liked the additional information offered at the bottom of each interview screen - there was a "? More" button next to a question, such as "What if I have more than one business?" At the end of the interview, a list of suggested steps pops up, including setting up additional users and passwords, entering historical transactions, customizing invoices, and setting up 1099 tracking. There were two options for Online Payroll Service, one for automatic deposit of employee checks into their bank account and online payroll tax service. The tax service appealed to me, since my husband and I now have to pay quarterly taxes. This service allows us to pay our federal and state taxes online, file federal and state forms online, and also prepares necessary W-2 or W-3 forms, and automatically sends tax updates. 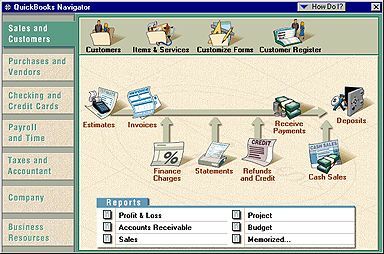 Once setup was complete, a Navigator menu appeared, allowing selections for Sales and Customers, Purchases and Vendors, Checking and Credit Cards, Time and Employees, Taxes and Accountant, Company, and Business Resources. The Navigator can be closed, but a nifty little button is at the top right corner of the screen for easy access. After I'd set up accounts for my husband and me, I went about entering bills, vendors, income received, etc. Everything went pretty smoothly, as there was help available pretty much anywhere in the program. There are also extra help options, such as QuickBooks seminars and training and Professional Advisors in your area. This is available as an option, but your bank needs to be a participating financial institution. If it is, then this is great - you can check your account balances, transfer money online, download transactions from a checking, savings, money market or credit/charge card account, plus you can send online payment instructions to pay bills. The only caveat with the latter is that the payee must be set up to receive electronic payment or you can request the bank to print and send a check for you (you're better off doing that yourself, it costs less). The monthly fee is determined by your bank, which varies. Adding new vendors or items in my husband's account was a breeze when in Invoice or Bill mode, but with my account, I got an error and the program shut down. I had to go to Items or Vendors direct, add any new ones, then to Invoice or Bill and enter my information. A pain! When tabbing from line to line, I wish the pull-down menus would automatically pull down so that I can select from it. As it is, I need to tab to a particular line, move the cursor to a "down" arrow to activate the pull-down menu, then select from there. One neat thing, though, is that I can type in the first few letters of the vendor, item, etc and it automatically goes to that name. Set-up was fairly easy, though I had to really read the books and watch some of the SHOW ME videos on the CD-ROM to understand how to set up what I needed. I liked the fact you can easily customize each account to fit what you do. This is definitely a boon for small business owners and those who are self-employed, like my husband and me.